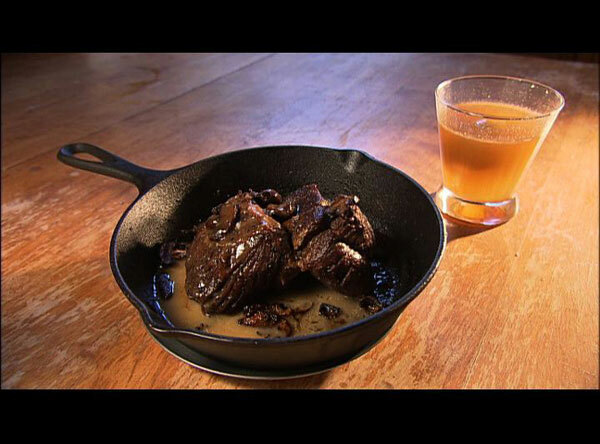 Roast bear with mushrooms and a hot apple toddy; film still from an upcoming episode of New York Wave. Over the past few weeks, I’ve been shooting a short documentary about my work for PBS Japan, for a show called New York Wave. They wanted me to prepare dinner for the show’s host and asked if there was anything unusual that I have been aching to cook up. It came to me like a flash: Roast Bear. Roast Bear was served that evening. I thought it was so unusual and fascinating–I had never seen bear included on a menu, let alone in New York city. After doing a little more reading (in the very handy Oxford Encyclopedia of Food and Drink in America) I found out that bear was commonly hunted and eaten in early America; in the 19th century, it was still sold in markets in New York. Until the end of the century, roast leg of bear was served as a delicacy in New York restaurants. It was decided: we would eat bear for dinner. So where does one come across bear meat in this day and age? You cannot sell hunted game meat in America–game sold in markets today is farmed. The best way to get it is to make a few friends in Alaska, which I happen to have. It’s legal to hunt bear there, and if you ask really nice, someone will know someone who would be willing to ship you a roast or two. And if you’re really lucky, about six pounds of black bear rump meat and tenderloin will arrive via airmail to your Queens apartment. I consulted Miss Corson’s recipe for roast beef; and she recommends searing it, roasting it, and then preparing a simple gravy from the pan drippings. This method sounded about right; I wanted to prepare the meat simply to get the full effect of its flavor. Eating omnivores, like bear, can give you all kinds of parasites. It’s best to cook it well done; I used the same temperature guidelines recommended for cooking pork. I cooked a rump roast, but this recipe should work well for any smaller cut of bear. 1. Preheat oven to 425 degrees. Rinse bear meat and part dry. Cover generously with salt and pepper. 2. Clarify the butter: heat it in a microwave until it melts, then gently skim off the fatty solids that have separated to the top. Pour butter into a cast iron skillet, being careful not to disturb any sediment that may have sunk to the bottom. 3. Heat skillet over high heat. Place bear in skillet and sear on all sides until browned. Add mushrooms to the skillet–it’s ok if the bear is buried in shrooms. They’ll cook down. 4. Move bear directly from stovetop into oven; roast 10 minutes per pound, until a meat thermometer in the center reads 145 degrees. Remove from oven and allow to rest before carving. 5. In the meantime, make the sauce. Pour bear drippings from the skillet into a saucepan and add flour. Cook over medium heat until the flour is browned, then add water while whisking constantly. Let the sauce cook until it thickens to your desired consistency–anything from a thin sauce to a thick gravy is fine. 6. Carve meat into one-inch thick slices. Serve, topped with mushrooms and sauce. The gravy is a must because the meat is a little dry; and because the sauce is made with pure bear goodness, it doesn’t detract from the flavor, but enriches it. After my first bite of bear, if someone had told me it was beef, I would have believed them. There is a darker, gamier note, but not the stringy, gamey meat I expected. It was more than edible–its was good. I ate my whole plate. Wow, I’m from Mississippi and hearing the term deer meat still eeks me out a little bit but something sounds really delicious about bear. Sounds like a really hefty meal. Oh, I love a cut of vension! It’s such an irony loving game meat and living in New York: in Ohio, where I’m from, people have freezers full of deer that they beg you to take. In New York, you pay an arm and a leg for a cut of farmed venison. the acidity of the cocktail cut through the rich flavor of the meat. Excellent! My very own Alaskan friend has bear meat in his freezer, and has been waiting for me to figure out what we’re going to do with it. This sounds great and straightforward. I am watching NHK and they introduced this blog.so im here writing this comment..
WOw your blog is awesome. I also have a strong interest in food culture, and i have a lunch-party organization called lunch trip, and we go to many different cuisine restaurant in Tokyo to learn other cultures abroad. But you gave me another aspect to learn cuisine..History cooking..so yummy and very interesting! thank you. Hey—just came across your blog for the first time. Would you believe I was searching for bear meat availability? I’m a culinary explorer myself—and for a few years after college, I lived near Malmö, Sweden, where a state-licensed wild game store sold ground bear on a regular basis. David– that’s so funny, my friends in Alaska are appalled I ate bear. Everyone thinks it’s so greasy and gamey, but I found neither to be true. I’d probable not cook it for a weeknight dinner, but I did find it to be as good as a steak. Bear is legal to hunt in many states, not just Alaska. We just shot a bear this weekend in Oregon. With a bear license from the state. Not really a novelty available only in Alaska. If you’re bow-hunting, a nice back-up is in order. Perhaps a 12 guage with alternating rounds of slug & double O Buck? I love the suggestions. Having done as pork t loin.